Today we review a 2006 Italian red that is often called a “Super Tuscan”, even though it doesn’t say that anywhere on the label. (More on that in the Boring Note at the end of this review.) It costs $22 at Total Wine, which is a little too high since many merchants are selling this wine for around $15 or $16, as you can see here. 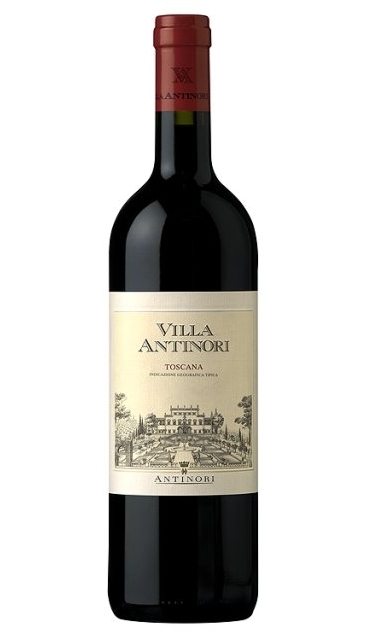 OK I really liked Villa Antinori Toscana. It tastes very deep and dark, like distilled blackberries and cranberries buried under oak, lots of tannins, and a little chocolate. Smooth. Dense. A little smoky. A very dry, luxurious texture, and an inviting aroma with a fair amount of alcohol in there. Balancing that dry texture is a warm juiciness in the flavor. Basically, it tastes like a very good, extra dense and juicy chianti classico. It is 60% sangiovese, 20% cabernet sauvignon, 15% merlot, and 5% syrah. There is no law that specifies what a Super Tuscan is. It is generally a wine from Tuscany (Toscana, in Italian) that has a blend of grapes similar to chianti. The term used to be reserved for truly kickass wines, so of course today all wines like this are called Super Tuscan. Many Super Tuscans replace some of the sangiovese that is required to dominate chianti with cabernet sauvignon (true for the wine reviewed today). Many Super Tuscans say Indicazione Geografica Tipica on the label. IGT generally means that you are getting grapes from the location shown on the label, in this case, Tuscany…. Whew. I’m already bored, and we didn’t even scratch the surface of Italian wine rules and vocabulary. Is this stuff worth learning? I’m not sure — even if you master it, you find that it does not allow you to choose great wines. You still have to go by word of mouth (or trial and error). I would just sit back and read Wineguider.